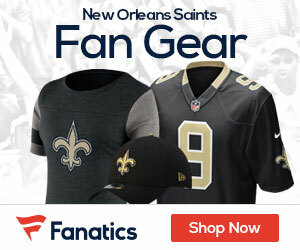 The New Orleans Saints organization is currently immersed in the very heart of their 2019 NFL Off-Season activity, both with signing veteran players in Free Agency and preparing for the 2019 NFL Draft later that takes place later on this month. But as that's been going on, one of the more intriguing questions with regard to the team's plans for the upcoming season among many Who Dats fans at the moment; is what they might decide to do about bringing back former Dallas Cowboys All-Pro and Oklahoma State University All-American WR Dez Bryant — the 30 year old veteran who they signed to a one-year deal last November, but lost him to a torn Achilles in his very first practice before he ever got the chance to play in a single game. However, for those Saints fans that were hoping for Bryant to get another chance at becoming a part of the team's WR corps when the 2019 NFL Season rolls around in early September, you probably shouldn't hold your breath. That's simply because if you 'read between the lines' of the comments made by Saints head coach Sean Payton said to reporters last week at the NFL Owner's Meetings in Phoenix, it doesn't seem likely that the sometimes controversial Galveston, Texas native Bryant fits into their plans for the future. "I just know he's been rehabbing. I wouldn't be able to forecast the future relative to Dez." Payton's comments certainly suggest that the organization is going to move forward without Bryant on their roster, even though Bryant himself has expressed interest in returning to New Orleans through his Twitter account in recent weeks. Additionally, Bryant was also spotted doing some rehabbing last week with former LSU safety Jamal Adams (who plays for the New York Jets), which may have been what prompted Payton's specific reference to Bryant's most-recently known activity. Payton's comments to reporters also would seem to contrast directly with previous reports, specifically that of NFL Network reporter Jane Slater, who earlier this month Tweeted that the Saints were in fact interested in bringing back the 9th year veteran to NOLA for at least one season with an option for possibly more. Keep in mind: the Saints still have #1 WR Michael Thomas, #2 WR Ted Ginn, Jr., Cam Meredith, and rookies Tre'Quan Smith and Keith Kirkwood on the current roster; and there's also a very distinct possibility that they'll seek to add another receiver in the upcoming 2019 NFL Draft in 3 weeks from now, perhaps with a talented youngster such as former Iowa State University Cyclones WR (and potential "superstar") Hakeem Butler (pictured right below). That (the Saints drafting another WR) more than anything, could ultimately determine where Bryant ends up when it's all said and done. Previously in recent months, Bryant repeatedly has referred to the injury that he suffered at the team's Metairie Training Facility back on that fateful day (Friday, November 9th) as the "ultimate test" to his playing career and perhaps even in life itself, after he had already sat out the first 9 games of last season before eventually signing with New Orleans. Bryant also was very vocal about how supportive that Payton and other fellow players such as Drew Brees and Alvin Kamara had been to been him, and their desire to see him to play for the Saints organization and of course have a great chance at getting to the Super Bowl. Bryant even made it a point to mention that is was one of the main reasons why he ultimately decide to choose playing for the Black and Gold over other interested teams. Back at that time in November right before the injury, his brand new teammates quickly had welcomed him into the Saints "family"; and several players including Thomas decided to pay tribute to him by throwing up Bryant's signature "X" celebration after touchdowns in the Saints' 51-14 win over the Cincinnati Bengals in Week #10. But Bryant was hurt in practice just a few short days later, and now the 3-time Pro Bowler is faced with the prospect of trying to figure out exactly where his career path will take him next, and if New Orleans is in fact (or not) the place where it will occur. The 6-foot-2, 220-pound Bryant still hasn't played a single down of NFL action since the end of the 2017 NFL Season, after playing the previous 8 years for the Cowboys. Bryant — who hasn't eclipsed 1,000 receiving yards in an NFL season since the 2014 Season nearly 5 years ago — caught 69 passes for 838 yards and 6 touchdowns for Dallas in 2017. Bryant has dealt with a number of ailments the past 3 years: he’s battled foot, ankle, back, and knee injuries, which have caused him to miss 10 games the past three seasons (after stringing together 3 seasons of all 16 games played between 2012-2014). To his credit, Bryant was still able to manage playing in all 16 games for Dallas in 2017. In 8 total career seasons (not including 2018 since he never actually got to play) all with the Cowboys, Bryant has caught 531 receptions for 7,459 yards and 73 touchdowns. But he has gone 23 consecutive games in a row now without a 100-yard receiving game, with his last one coming against the Pittsburgh Steelers on November 13th of 2016. That has led to the belief that as he's gotten older, Dez has been unable to avoid injuries as well as he could in his younger playing days, which some view as a clear sign that he is a declining player physically. While that might actually be the case, the prevailing notion among most observers is that Dez can still play for a few more seasons and be a key contributor to the right team (especially for a team like the Saints that's perhaps only one or two more very good "role" players away from being almost guaranteed of winning the Super Bowl). The bottom line is simply that the Saints are "all in" on winning the Super Bowl this year, and if they still believe that Bryant can become a solid contributor for them and eventually help them achieve that goal, then it wouldn't come as a shock if the team shifts gears and makes Bryant a new offer. likely on an incentive-laden 1-year deal. Conversely, Dez essentially would like the opportunity to "clear his name" of all of the controversial years that he spent previously in Dallas; and hopefully end his playing career on a high note, which of course would be winning the Super Bowl. And since the Black and Gold basically were one play away from getting there a few months ago, it's pretty evident that the Saints are Bryant's top choice for where he will play at next. Do the Saints (and Payton) actually feel the same way about Dez?